Barbara and Tabitha are now an item. They exchange kisses goodbye before Tabitha heads out to wreak havoc. Theo comes in with breakfast and Tabitha gives Barbara a final kiss, as if claiming her territory. Theo explains to Barbara that his family literally built Gotham – they carved the bedrock of the city, but their legacy has been scrapped from the history books. He wants revenge, and promises to help Barbara destroy Jim. Not kill him, but destroy him. Jim and Harvey have been roughing up local thugs, looking for leads on Jerome. They have had no luck, and Harvey wants to check in with Penguin – something Jim does not want to do. He finally agrees to go check in with him in the morning. They have a new lead to follow up on: Jerome’s blind father, Paul. Tabitha and Jerome already have Paul bound and gagged. He waxes on about his crummy, abusive childhood, and about what a bad father Paul was. Paul begs Jerome not to kill him, insisting he loves him, but Jerome is too far gone. He is there to frame Paul for breaking him out of Arkham Asylum, complete with blueprints, letters with secret braille messages, and knock-out gas. Just as he is about to kill Paul, GCPD knocks on the door. Jim and Harvey hear a noise inside and break in. They find Paul dead, with a knife in his eye, and the window open, clearly Jerome and Tabitha’s escape route. Jim tries to follow the villains while Harvey checks on Paul. Jerome has rigged it so that Paul’s hand is on a can of gas. When Harvey moves it, he gets hit by the purple toxin. Jim drags Harvey out to the hall, but the both get a hit of the gas. Jerome comes back to mess with them, and a clumsy fight breaks out. Tabitha stops Jerome before he can kill Jim. That night there is a big gala benefit for the children’s hospital. Lee is the emcee; she has to go. Jim declines the invite. Too bad, because this is where things get good. Alfred drags Bruce to event, claiming it is his duty. He doesn’t want to be there, until he sees Selena, who is “working” (pickpocketing). Bruce is disappointed when she blows him off and returns to Alfred who is hitting on Lee in a charming, but obvious way. 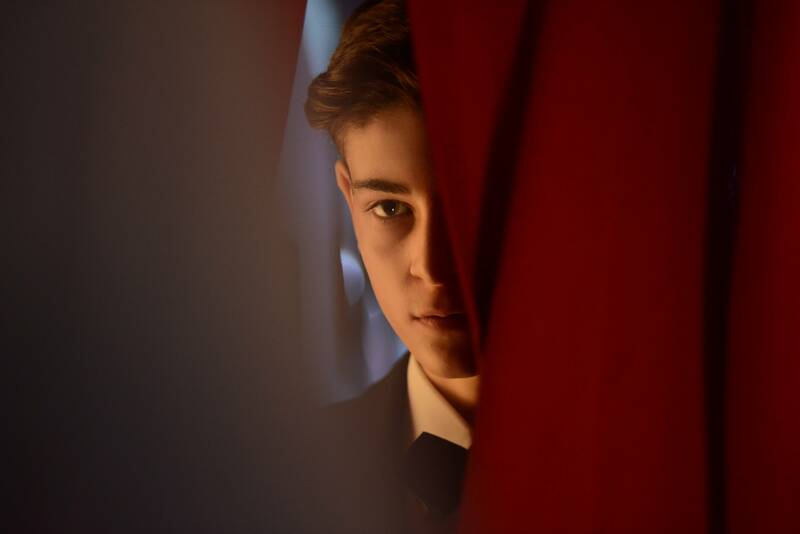 Theo is on his way to the gala as well – he has promised Barbara that he is going to be the hero Gotham needs. Lee introduces the evening’s entertainment, a magician named the Great Rodolfo. Of course, the audience knows that Rodolfo is really Jerome, and his lovely assistant is Barbara. After some simple sleight of hand, Rodolfo needs a volunteer from the audience, and he calls on Bruce. Bruce doesn’t like magicians and is hesitant to go on stage; a look from Selena makes him relent. 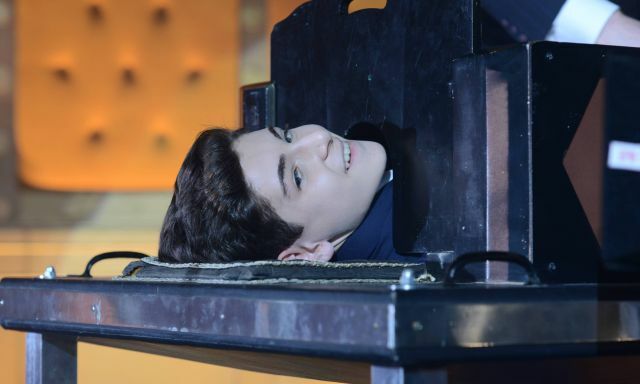 He is being used for the “saw a person in half” trick, and as Rodolfo is about to put in the blades, Alfred gets nervous and begs him to wait. He doesn’t. The trick happens, and Bruce is safe. Alfred feels foolish. When Barbara walks Bruce back into the audience, Lee suddenly feels uneasy, like there is something familiar with the pair. Next up is deputy mayor Kane, for a sword-throwing trick. As he is brought on stage, Barbara pulls off her mask for a moment and gives Lee a little wink. She panics and calls Jim. She barely gets the words out of her mouth before someone ethers her and drags her away. On stage, Rodolfo “jokes” that no one is getting out of here alive – then he throws a knife at Kane, killing him. Chaos erupts, people scream, waiters reveal their automatic weapons, and Alfred starts beating up a nearby thug. Bruce slips away from Alfred to follow Selena, who leads them out a secret passage. Halfway through, Bruce decides he can’t abandon Alfred and returns to the gala – but does tell Selena that he misses her. Jim arrives to find police on the scene, but no one is doing anything. A phone call comes in from Jerome, on Lee’s phone, inviting him to watch the live news feeds. Lee is strapped to the knife throwing board. Jerome lists his demands and gives him ten minutes or he starts killing people. One of the officers refuses to send his men in because the situation is too volatile. Jim decides he will do it himself. Inside, Theo walks in and tells Jerome it is time to pack up and leave. Theo is a terrible actor – you’d think if he wants to play the hero, he would take a couple acting classes. He offers himself up as a hostage, and Barbara knocks him out. She then starts picking on Lee, promising that she and Jim will be back together because they both have a dark side. Lee kicks Barbara, and Barbara responds by knocking her out. Jerome is getting impatient and calls Bruce back up to the stage. Bruce is hiding behind a curtain and waits to see how things unfold. 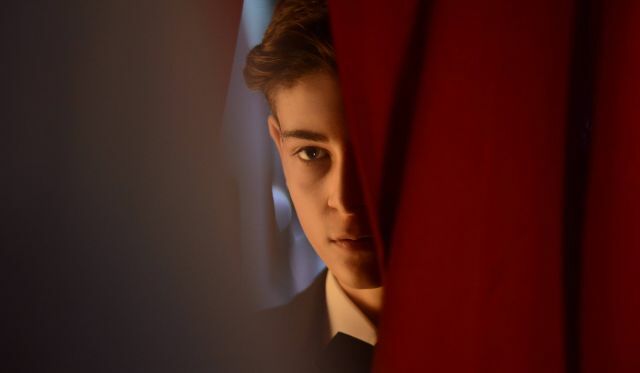 When he doesn’t reveal himself, Jerome gets impatient and promises to kill Alfred. Bruce is about to step forward when Jim makes his presence known. Bruce marches straight to Alfred and gives him a brief hug. It is enough time to slip Alfred a gun that Jim slipped to him, and warn him that Jim is behind the curtain. Then Bruce is pulled on stage. 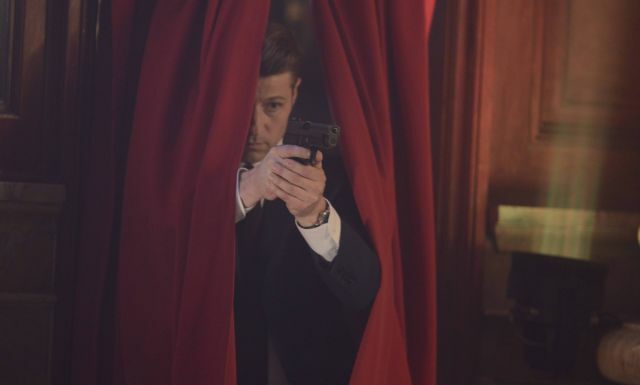 Jim appears and he and Alfred start shooting. In response, Jerome holds a knife to Bruce’s throat. Theo comes around and grabs Jerome. “This is not how we rehearsed it,” he whispers – then stabs Jerome in the neck. Blood pours and Jerome dies with a twisted, evil smile on his face. Barbara disappears into a magic prop before Jim can catch her. With the situation under control, the rest of the force moves in to care for the wounded, wheel out the dead, and take statements. Theo is regarded as a true hero, with thanks all around. Alfred takes Bruce home, but not before making one final pass at Lee. Jim is amused by this and insists Lee kiss him. Alfred sees this. “Oh bugger,” he grumbles – then accuses Bruce of keeping Lee’s relationship status a secret from him. Barbara is back at Theo’s loft, watching the news coverage when Theo returns home. “Now the real fun begins,” he promises her. Barbara kisses him deeply, a kiss that Tabitha sees – and is not happy about. All over the city, people are watching the news reports, and seeing Jerome’s dying giggle and smile. It seems to be infectious, for soon there are a dozen miscreants giggling and grinning as they wander the city, wreaking havoc. So is Jerome really dead? I get the sense that the scenes of the other people taking on Jerome’s laugh and grin are meant to imply that Jerome’s insanity is infectious; that perhaps Jerome is not truly the Joker, the one who goes against Batman, but that he is merely the inspiration for whomever becomes the true Joker. It’s a bummer, because Cameron Monaghan, who plays Jerome, is absolutely phenomenal. A perfect Joker. Preview next week’s all-new Gotham right here!